1. 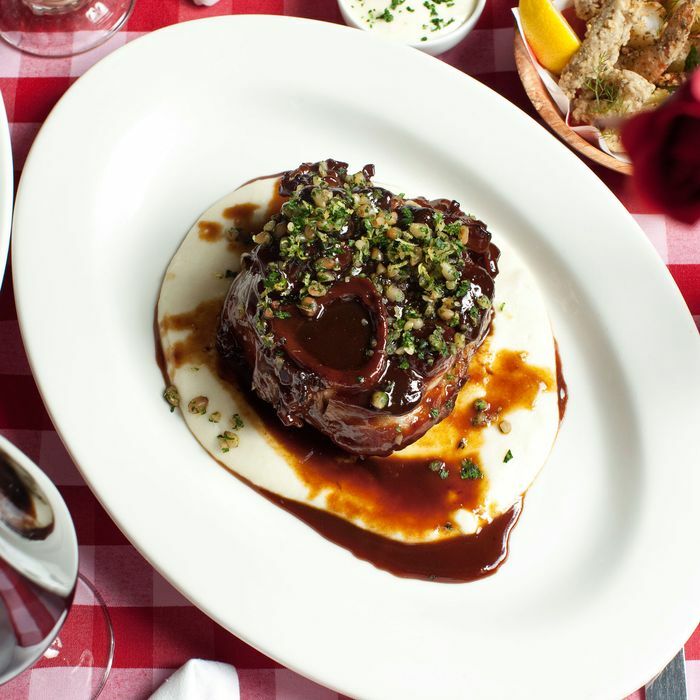 Eat osso bucco at Daniel Humm and Will Guidara’s red-sauce pop-up. After a summer vacation, Mama Guidara’s is back. The red-sauce pop-up at the Nomad Bar has returned to take care of all of your Sunday gravy needs, with a few new dishes on the menu ($68 for four courses). Among them, there’s a fish, shrimp, squid, and vegetable fritto misto; orecchiette and meatballs; osso bucco; and raspberry-and-pistachio cheesecake. Tables are available for groups of up to six people from 5 p.m. to 10 p.m., by calling 347-472-5660, or emailing dining@thenomadhotel.com. 2. Head to New Jersey for a one-time Turkish dinner with dishes from one of the year’s most anticipated cookbooks. Writer Robyn Eckhardt and photographer David Hagerman have compellingly covered the culinary cultures of Malaysia, Indonesia, and elsewhere on their blog Eating Asia and in publications from around the world. On October 19, they will publish their first book, Istanbul and Beyond: Exploring the Diverse Cuisines of Turkey. It’s a culmination of a two-decade-long obsession with the country and its food, and to celebrate the duo are doing a series of dinners. They’ll be dropping by New Jersey’s Cinar, where they and the cooks will prepare a dinner ($60, more information here) with dishes like rice-stuffed mussels, and bulgur dumplings in tomato and mint sauce, from the book. Fans can also get their books signed. 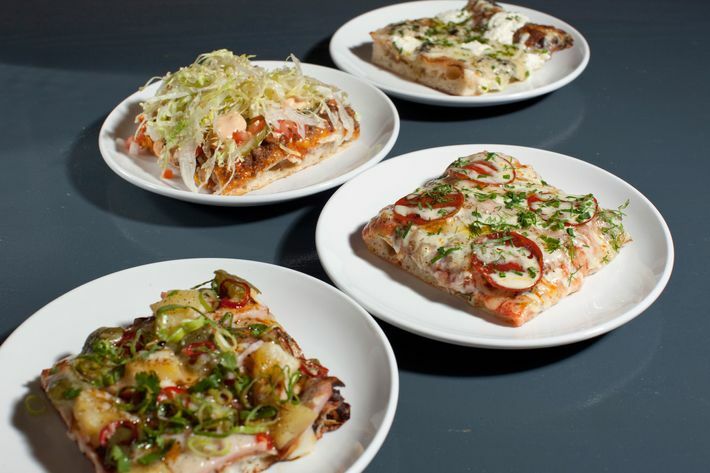 East Village cocktail bar Loverboy has joined the great square pizza stampede, so you can now drink your frozen cocktail and eat a pepperoni slice, too. The Mother’s Ruin sister bar now serves six slices (all $4 to $5), that are made with a crust that’s not doughy but focaccia-like, if only crispier. As for toppings, they take a maximalist approach that wouldn’t be out of place at a Pizza Hut competitor. There’s a cheeseburger pizza, the Mc4 Guys, which is buried in shredded iceberg lettuce and topped with ground beef, thickly sliced pickles, and Big Mac–esque special sauce. It’s sloppy, a little silly, and exactly the sort of thing you’d want to eat four cocktails deep. 4. … Or get your square pizza delivered. Speaking of square pies: Gotham Market West stall Corner Slice now delivers all over Manhattan. Since Mike Bergmann opened the operation with Ivan Orkin earlier this year, he says he’s been tweaking the dough and baking method to get it up to snuff for delivery. They’ve introduced some “House Special” pies as well, including one inspired by Sally’s, the Bacon & Onion ($30), and white pies like the Mister G ($32), with meatballs, oven-dried tomatoes, and three kinds of cheese. 5. 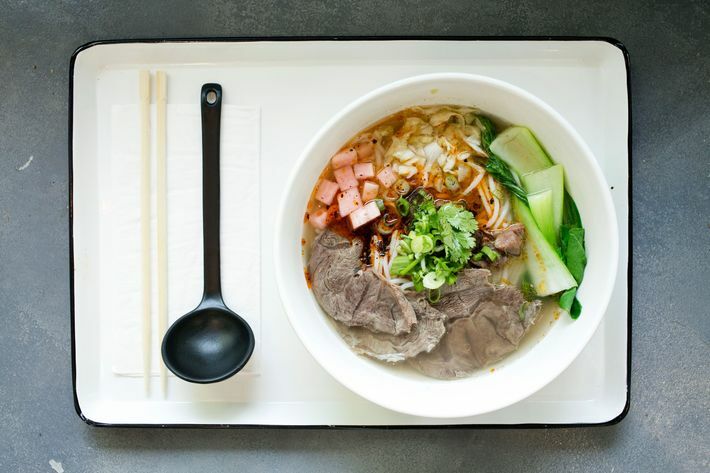 Check out New York’s latest rice-noodle shop. Downtown’s rice-noodle boom ain’t over yet. Joining the Rice Noodle, Little Tong, and Deng Ji, the cleverly named Just for Fen (fěn in Mandarin means rice noodle) quietly soft-opened in the East Village. There was no sound of thwacking hand-pulled noodles to give them away, but the bright, trendy-looking restaurant (229 1st Avenue) deserves some attention. There are seven bowls of noodles ($8.95 to $12.95) and six made with rice noodles, including one with particularly tasty cubes of braised beef and sliced beef shank in a beef broth. (Get it spicy.) Others are made with lamb or minced pork and pickled string beans, and there a sides like a vinegary, crunchy potato strip salad ($4). 6. Take your lunch break at El Atoradero. Craving afternoon tamales? You can get them on weekdays now at El Atoradero Brooklyn, which recently started serving lunch Monday through Friday. The Prospect Heights restaurant is one of the city’s best for Mexican, and they’re serving dishes like cecina with eggs ($18), torta ahogado ($13; a sandwich drowned in red chili sauce), and chilaquiles ($12 or $15 with meat). 7. Celebrate the start of sake (production) season at Ivan Ramen. Food holidays of the “National Special Sauce Day” are silly marketing gimmicks. World Sake Day is not one of those. It’s a booze-centric, historic celebration that marked the beginning of sake production in Japan, and was for a time regarded as its only national event. One of New York’s best and most popular ramen spots, Ivan Ramen, will celebrate it with a month-long special sake list. Kinoshita-Shuzou Tamagawa’s Philip Harper, the first non-Japanese toji or master sake brewer, will take over the menu with imports otherwise unavailable in this country. There will also be merchandise from Tamagawa and artwork from artist Zai Wei Zhang. 8. Eat some of Los Angeles’s best Thai food when Night + Market pops up in Brooklyn for one night only. To close out the year, Williamsburg restaurant Reynard (which recently got a new chef) will host three of the West Coast’s most popular restaurants. This month’s guest is the Los Angeles Thai favorite Night + Market, which will come to town on October 4 ($78.62, tickets here) to celebrate the release of its first cookbook. Expect Thai boxing chicken, pork toro, crispy rice salad, and a special roti dessert. Dinner includes a signed and discounted copy of Night + Market: Delicious Thai Food to Facilitate Drinking and Fun-Having Amongst Friends. 9. Or drop by Gloria for one of its special wine dinners this month. Speaking of boozing: Pescatarian restaurant Gloria will host a series of dinners spotlighting natural winemakers and brewers. Chef Diego Garcia will cook new and different dishes for each dinner, all of which will focus on American producers. This month, they’ll host California winemakers Donkey and the Goat on October 4 and Matthiasson Wines on October 19. Both dinners start at 7 p.m. and are $98; reservations can be made by emailing info@gloria-nyc.com. 10. Eat food cooked by David Tanis, instead of cooking one of his recipes in your city kitchen. On October 8, influential chef Ignacio Mattos will host New York Times writer and former Chez Panisse chef David Tanis for a one-night dinner at Cafe Altro Paradiso. They’re celebrating his latest cookbook, David Tanis Market Cooking: Recipes and Revelations, Ingredient by Ingredient, and roasting chilis outside the restaurant. Reservations can be made via Resy or by emailing info@cafealtroparadiso.com. 11. Celebrate Diwali at the Old Monk. October 19 marks the beginning of Diwali, the Hindu festival of lights. To mark the occasion, Old Monk chef Navjot Arora will serve a special jackfruit curry ($19). He’ll also drop by the James Beard House for a dinner on October 21 ($135 for members, $175 for the public), where he’ll serve Goan prawn lollipops, ginger lamb chops, cardamom-and-pistachio Indian bread pudding, and more. 12. Get a seat at J.J. Johnson’s Chefs Club pop-up. The former chef of the Cecil, J.J. Johnson, is back — sort of. On October 2, he’ll head downtown to start his residency at Chefs Club. Through October 31, but possibly longer, he’ll serve dishes like a short rib for two ($75) with Carolina gold rice, hoisin, and house roti; udon noodles ($28) with braised goat and West African peanut sauce; and more. This kind of cooking will be familiar to fans of the Cecil, where Johnson blended West African and East Asian dishes and ingredients, and it’ll be his testing ground for a forthcoming restaurant.